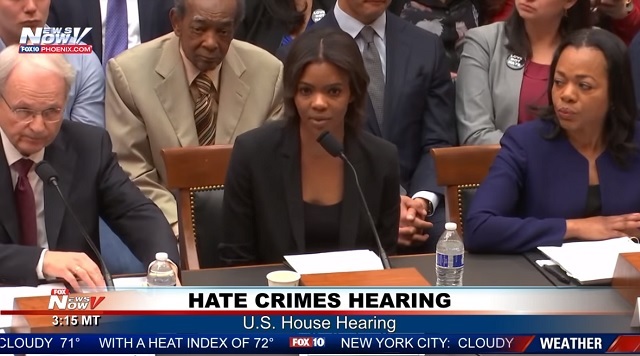 Conservative activist Candace Owens derailed Jerry Nadler's House Judiciary Committee hearing on "Hate Crimes and White Nationalism" by calling it out as a farce to scare minorities into supporting censorship and the Democratic Party. CANDACE OWENS, TURNING POINT USA: Mr. Chairman, Ranking Member Mr. Collins thank you for having me here today. I received word on my way in that many of the journalist were confused as to why I was invited and none of them knew that I am myself was a victim of a hate crime when I was in high school. That is something that very few people know about me because the media and the journalists on the left are not interested in telling the truth about me because I don't fit the stereotype of what they like to see in black people. I am a Democrat. I support the President of the United States and I advocate for things that are actually affecting the black community. I am honored to be here today in front of you all because the person sitting behind me is my 75-year-old grandfather. I have always considered myself to be my grandfather's child and I mean to say that my sense of humor, my passion and my work ethic all comes from the man that is sitting behind me. My grandfather grew up on a sharecropping farm in the segregated South. He grew up in an America where words like racism and white nationalism held real meaning under the Democratic Party's Jim Crow laws. My grandfather's first job was given to him at the age of five years old and his job was to lay tobacco out to dry in an addict in the South. My grandfather has picked cotton and he has also had experiences with the Democrat terrorist organization of that time, the Ku Klux Klan. They would regularly visit his home and they would shoot bullets into it. They had an issue with his father, my great-grandfather. During my formative years I have the privilege of growing up in my grandfather's home. It is going to shock the committee but not once, not in a single breath of a conversation did my grandfather and tell me that I could not do something because of my skin color. Not once did my grandfather hold a gripe against the white man. I was simply never taught to view myself as a victim because of my heritage. I--I learned about faith in God, family and hard work. Those were the only lessons of my childhood. Here are some things we never hear. 75 percent of the black boys in California don't meet state reading standards. In inner cities like Baltimore within five high schools and one middle school not a single student was found to be proficient in math or reading in 2016. The singlehood--these single motherhood rate in the black community which is at 23 percent in the 1960s when my grandfather was coming out is at a staggering 74 percent today. I am guessing there will be no committee hearings about that. There are more black babies born--there are more black babies aborted than born alive in cities like New York and you have Democrat governor Andrew Cuomo lighting of buildings to celebrate late-term abortions. I could go on and on. My point is that white nationalist--white nationalism does not do any of those things that I just brought up. Democrat policies did. Let me be clear the hearing today is not about white nationalism or hate crimes, it is about fear mongering, power and control. It is a preview of a Democrat 20/20 election strategy the same as the Democrat 2016 election strategy. They blame Facebook. They blame Google. They blame Twitter. Really, they blame the birth of social media which has disrupted their monopoly on minds. They called this hearing because they believe that if it wasn't for social media voices like mine would never exist, that my movement Blexit which is inspiring lack of Americans to lead--to leave the Democrat party would have never come about and they certainly believe that Donald Trump would not be in office today. Looking on the next thing to focus on now that the Russian collusion hoax has fallen apart. What they won't tell you about the statistics and the rise of white nationalism is that they have simply change the data set points by widening the definition of hate crimes and upping the number of reporting agencies that are able to report on them. What I mean to say is that they are manipulating statistics. If they were serious about the rise of hate crimes they may perhaps be examining themselves and the hate they have drummed up in this country. Bottom line is that white supremacy, racism, national--white nationalism, words that once held real meaning have now become nothing more than election strategies. Every four years the black communities offered handouts and fear, handouts and fear. Reparations and white nationalism. This is the Democrat preview. Of course society is not perfectible. We have heard testimony of that today. There are pockets of evil that exist in those things are horrible and they should be condemned. But I believe the legacy of the ancestry of black Americans is being insulted every single day. I will not pretend to be a victim in this country. I know that that makes many country on the left uncomfortable. I want to talk about real issues in black America theater want to talk about real issues in this country, real concerns. The biggest scandal--this is my last sentence--in American politics is that Democrats have been conning minorities into the belief that we are perpetual victims all but ensuring our failure. Racial division and class warfare are central to the Democrat party platform. They need Blacks to hate whites, the rich to hate the poor. Soon enough it will be the tall hating the short.